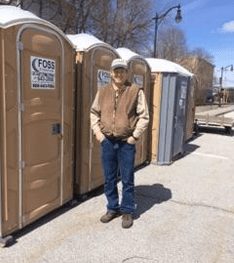 Foss Enterprises offers high-quality portable toilet and sink rentals, as well as septic tank pumping and related services throughout most of central Maine, as well as surrounding areas when requested. You can rely on us for professional service at a reasonable price throughout Central Maine. Owners Allyn and Lisa Foss have built a reputation as being reliable, easy to work with and offering fair prices. They work very hard to exceed customer expectations and provide friendly, courteous service. They believe that a reputation as an honest and reliable business is the recipe for success. Please note that we will consider service in other areas for sufficient orders. Typically, we have to charge more for long-distance travel. However, we try to be very competitive with our pricing and believe that you will be satisfied with our fair prices. Also, if we can’t help you, we try to find you someone who can. Thank you for allowing us to serve you since 2002!